Located on exclusive Mont Jean, Villa UJV 184, also known as La Vue Panoramique, is a 2 bedroom villa enjoying 300 degree breathtaking views. St Maarten, Anguilla, Marigot Bay and Grand Cul de Sac are included in the sight. The large overflow infinity pool with its wide deck and lava stone finish is a further addition to the spectacular views. The pool is heated during the winter season. The huge and luxurious open livingroom offers the comfort of its white sofas and chairs from Mitchell Gold contrasting with the dark brown furniture, fabrics from Scalamandre and Lee Jofa and accessories from John Rosselli. The spectacular master bedroom has beautiful Bielecky Brothers wicker and leather furnishings in particular and a sumptuous leather headboard. Three large windows, each with their own water views, together with the marble bathroom creates a special ambience. The second bedroom must be regarded as a luxury suite with its Cumaru wood floor connected to an office with a comfortable sofa. An open dining area with a round Kreiss travertine table and McKinnon and Harris chairs overlooks a water wall, the swimming pool and views of St Maarten and Anguilla. The separate kitchen is well-equipped. There is a unique tile mural evoking French wine, bread and cheese. An outdoor Lynx barbecue adjoins a pool terrace and overlooks the sea. 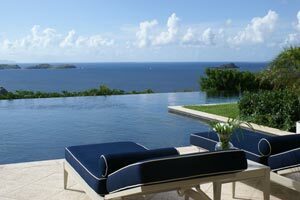 The numerous terraces overlook the 300 degree panoramic views and make great resting areas. Villa UJV 184 is both a charming villa and the extraordinary realization of the dream of its owners, a success in all areas.